Surrounded by meadows and about 100 hectares of forest of oaks and chestnut trees, the old farmhouse offers the opportunity to take beautiful walks and really be away from the rest of the world. 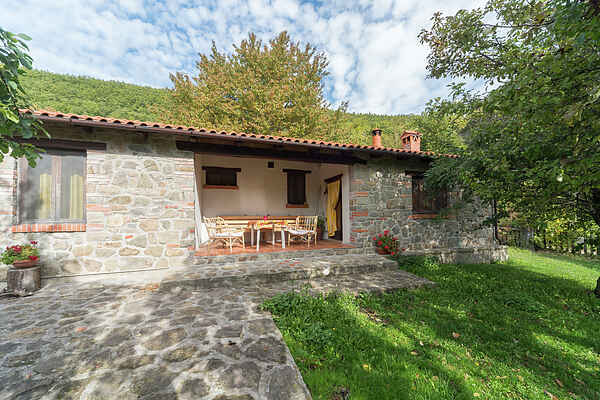 The three Partitoio houses are made of stone and wood from what originally was a barn; They are completely isolated in the countryside and have a nice southern exposure, they open up on a beautiful landscape. The houses are only a 15 minutes walk from the center of the village. 5 km by car. It is 29 km away from Pistoia, 50 km from Lucca, 60 km from Florence. In a few minutes you reach supermarkets, restaurants, etc. pizzarie. The sea is 1.5 hours away by car (Marina di Vecchiano - Viareggio). The pool is very simpel but fine for a little refreshing dive in summetime. - Center 5 km; - Pistoia 29 km; - Lucca 50 km; - Firenze 60 km; - Viareggio 98 km; - Marina di Vecchiano 94 km; - Restaurants 1 km; - Markets 1 km.